This blog post is written by Ayeh Bandeh-Ahmadi, PhD candidate at the Department of Economics, University of Maryland. This past spring, I spent a few months at the crowdfunding company Kickstarter, studying a number of aspects of the firm from what makes some projects succeed while others fail, preferences among backers, predictors of fraud, and market differences across geography and categories. I uncovered some fascinating tidbits through my research, but what stands out the most is just how much more challenging it is to run an effective crowdfunding service than you might think. For everything that has been written about crowdfunding’s great promise (Tim O’Reilly tweeted back in February “Seems to me that Kickstarter is the most important tech company since facebook. Maybe more important in the long run.”), its ability to deliver on fantastic and heretofore unachievable outcomes ultimately hinges on getting communities of people onto the same page about each other’s goals and expectations. In that regard, crowdfunding is all about overcoming a longstanding information problem, just like any other crowdguided system, and it offers some great lessons about both existing and missing tools for yielding better outcomes from crowdsourced science to the development of open knowledge repositories. What is both compelling and defining amongst crowdguided systems — from prediction markets, the question and answer site Quora, to crowdsourced science and funding platforms like Kickstarter, MedStartr and IndieGogo — is their ability to coordinate improvements in social welfare that were practically impossible before. The idea is that if we could combine efforts with the right collection of other individuals who have compatible goals and access to complimentary resources to ours, then we could achieve outcomes that previously or on our own might be impossible. In the case of crowdfunding, these resources might be largely financial, whereas in the case of crowdsourcing, they might involve time and other resources like computing power and expertise. In both cases, the promise of crowdguided approaches are their ability to arrive at pareto-improvements to outcomes (economists’ way of describing scenarios where some are better off but no one is worse off). Achieving those outcome improvements that were impossible under traditional institutions also requires coordination mechanisms that improve bandwidth for processing information, incentives, preferences, and resources across the community. opportunities for identifying meaningful problems with particularly high value to the community. Identifying communal values helps develop clearer definitions of relevant communities and important metrics for evaluating progress towards goals. opportunities for individuals to learn from others’ knowledge and experience. Under the right conditions, this can lead to more information and wisdom than any few individuals could collectively arrive at. opportunities for whole communities to coordinate allocation of effort, financing and other resources to maximize collective outcomes. Coordinating each person’s contribution can result in achieving the same or better outcomes with less duplication of effort. There are some great lessons to take from crowdfunding when it comes to building community, thinking about coordination mechanisms, and designing better tools for sharing information. A major part of Kickstarter’s success comes from its founders’ ability to bring together the creative community they have long been members of around projects the community particularly values. Despite the fact that technology projects like the Pebble watch and Ouya videogame controller receive a great deal of press and typically the largest funding, they still account for a smaller fraction of funding and backings than music or film, in large part a reflection of the site’s strength in its core creative community. It helps that projects that draw from a likeminded community have a built-in sense of trust, reputation and respect. Kickstarter further accomplishes a sense of community amongst backers of each project through facilitating meaningful rewards. By offering to share credit, methodology, the final product itself, and/or opportunities to weigh in on the design and execution of a project, the most thoughtful project creators help to align backers’ incentives with their own. In the case of crowdfunding, this often means incentivizing backers to spread the word via compelling calls to their own social networks. In the case of crowdsourcing science, getting the word out to other qualified networks of researchers is often equally important. Depending on the project, it may also be worth considering whether skewed participation could bias results. Likewise, the incentive structures facilitated through different credit-sharing mechanisms and opportunities for individuals to contribute to crowdsourced efforts in bigger, different ways are quite relevant to consider and worth economic investigation. I often hear from backers that the commitment mechanism is what compels them to back crowdfunding projects they otherwise wouldn’t. The possibility of making each individual’s contribution to the collective effort contingent on the group’s collective behavior is key to facilitating productive commitments from the crowd that were previously not achievable. Economists would be first to point out the clear moral hazard problem that exists in the absence of such a mechanism: if everyone suspects that everyone (or no one) else will already fund a project to their desired level, then no one will give to it. There is an analogous problem when it comes to crowdsourcing science in that each potential contributor needs to feel that their actions make a difference in personal or collective outcomes that they care about. Accordingly, it is important to understand what drives individuals to contribute — and this will certainly vary across different communities and types of project — in order to articulate and improve transparent incentive systems tailored to each. Finally, while crowdfunding projects focused on delivering technology often garner the most press, they also present some of the greatest challenges for these platforms. Technology projects face the greatest risks in part simply because developing technologies, like delivering scientific findings, can be especially risky. To aggravate matters further, individuals drawn to participating in these projects may have quite different personal incentives than those designing them. 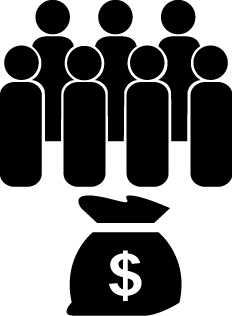 When it comes to especially risky science and technology projects, in crowdfunding as in crowdsourcing, the value of good citizen-input is especially high but the noise and potential for bias are likewise high as well. Finding ways to improve the community’s bandwidth for sharing and processing its collective wisdom, observations and preferences is, in my opinion, quite key to achieving greater innovation in crowdguided platforms. Luckily, economists have done quite a bit of work on design of prediction markets and other mechanisms for extracting information in noisy environments and on reputation mechanisms that could and perhaps ought to be extended to thinking about these problems. Next time, I’ll summarize some of the key findings from this research and areas where it could be better targeted to the design of crowdguided systems.